When you only play a course once a year or so, you tend to forget certain things. 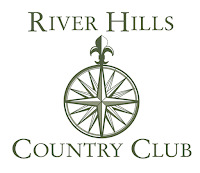 River Hills Country Club is one of those courses for me. I had only played it one time, which was last season in August. I wasn't playing overly well at the time and I ended up posting an ugly 102 which was adjusted to a 98 by tour rules. I didn't remember a whole lot about the course, but one thing I did remember is that is was a tight course. I knew, going in, that it was going to be a round which put a premium on keeping the ball in play. One of the things I failed to remember, is that the greens are excessively quick. Foolishly, I tell people that I 'love' putting on fast greens... which I do. 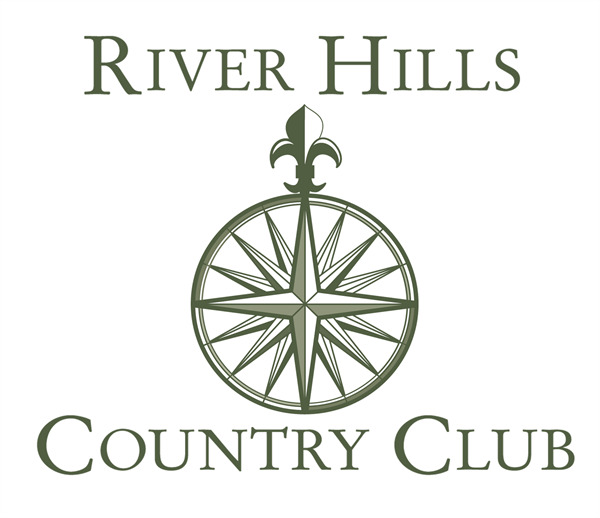 I just recently joined as a member of Rock Hill Country Club, and while the greens aren't ultra-quick... they're certainly fast enough that I'd label them fast. I spent a good 75 minutes on the practice green at RHCC on Friday working on 6 foot putts. I wanted to ensure that those weren't going to cost me extra strokes on Saturday. Well... suffice it to say that, by the time I reached the practice green at River Hills on Saturday... it didn't much matter. The greens there are F-A-S-T! Do NOT get above the hole or you risk a three-putt at any moment. Anyway... I was looking forward to the round and, honestly, I felt like I was going to have a pretty good shot at posting something reasonable and within the top four spots which would put me 'in the money' at another tournament. Unfortunately... things didn't go as planned, but... despite some struggles, I actually had some moments where I felt pretty good throughout the day. As always... details are below. I wasn't able to properly go through my practice routine at the range prior to my round. The club only allowed us to hit off the mats, which were essentially just a thin carpet placed on top of a cement platform. For this reason, I never really got warmed up. So, when we got to this tee, I measured the distance as 140 yards, up a hill... so, playing about 145. We also had a helping wind behind us, so... I figured it was a perfect club for my 8 iron. I hit that club about as well as I could have from the tee, but I came up a good 7 yards short. I was left with a tough lie on a slope in front of the green and my chip shot was horribly heavy and I advanced the ball about 5 feet. This left me with, pretty much, the same shot. This time, I nipped it perfectly and watched as the ball hit the pin and dropped in for an unlikely par. As you'll see throughout the round, hitting the pin or the cup became a theme throughout the day for me. One of the major downsides to the range situation at this course is that hitting driver to warm up is not a realistic proposition. I took maybe 4 swings with the club on the range and then realized that, due to the stance I was forced to take, it wasn't going to work out for me... so, I didn't get an idea of how I was going to hit the driver that day. Typically, I'll hit 10-15 shots with my driver on the range to 'work out' any issues I'm having and know what kind of a shot shape I'd be playing with, so... having only 4 swings did nothing for me. On the tee at #12, this was apparent as I pull-hooked my tee shot into the woods on the left. I then hit a similar provisional, but that one stayed in play. I was left with nothing more than a punched 5 iron beneath the trees and back into the fairway. This then left me about 140 to the hole out of the rough and over a tree. My 8 iron clipped the top of the tree but still made it to the green. From 43 feet, I was somehow able to two-putt for a double bogey. After my troubles on the tee on the previous hole, I wanted to be safe here, so I elected to hit a 4 iron from this tee. It found the fairway and left me about 155 yards to the hole. Unfortunately, I hit a dead-pull 7 iron that landed in a bush left of the green. After an unplayable lie, I hit the ball to the back of the green and watched as it rolled into the fringe. An extremely ugly putt from there left me 18 feet to avoid a triple, and I was somehow able to sink that for a second straight double bogey. There is really no need for a driver on this hole but, I stood on the tee and wanted to make a good swing with that club, so I chose to hit it. I hit a straight shot when I was looking for a cut and the ball ended up out of bounds by a few inches. This meant I had to go back to the tee. I hit a solid shot from there just off the right side of the fairway. That left me about 85 yards to a front pin. My lob wedge from the rough was short. I then chipped up and hit the pin again, but the ball didn't fall. Instead, it kicked out to about 9 feet where I was unable to save a double bogey this time and instead, settled for a triple on a fairly simple hole. I made an angry swing with the driver on this hole. Still, I tugged it left and watched as it hit the tree to the left of the fairway. Luckily, I found the rough next to the fairway trap which left me about 130 yards up the hill and into the breeze. I hit a 7 iron from there and caught the green, leaving me about 14 feet for birdie. Although I hit a good putt, it didn't drop and I settled for a tap-in par. Another driver... another pull. I got a beneficial kick off the cart path and back to the right, finishing in the fairway. This left little more than a wedge up the hill. I didn't hit the greatest shot from there, though, as the ball finished short and in the fringe. I putted from there to about 4 feet and was able to make that for a second consecutive par. My 6 iron from this tee was (you guessed it) pulled a bit. The ball stayed out to the left and finished pin-high in a bunker. I hit a pretty good shot from there to about 10 feet. Although it was only 10 feet, it was extremely quick. I somehow managed to find the proper line and the ball dropped giving me three straight pars and putting me in a good little groove. I love this hole. I think it's a pretty hole and can be trouble if not played properly. I hit a solid 4 iron that ran out to 225 yards and left me a 9 iron from about 135 yards to the back pin. I hit my shot right on line but it finished up in the middle of the green which left me about 28 feet for my birdie. I totally misread the green, however, and my putt finished about 5 feet to the right of the hole. I was unable to make that as the ball lipped out and I was left to settle for a tap-in bogey. ** NOTE - After the rough patch from 12 through 14, it was nice to put together some solid holes. As I headed to the front 9 with 10 holes left to play, I felt like I was very much in it. I just needed to avoid the big numbers and I'd be fine. My focus was on trying to keep the ball in play from the tee. If I could have done that, things would have been fine. I hit a solid drive from this tee but watched as it leaked just a bit towards the fairway bunker. Fortunately, it stayed out but finished just off the fairway. I was left with a 9 iron from there. I caught it well, but the ball only got to the front of the green. I was left with a 24 footer for birdie but I hit a horrible putt. I managed to make the 5 footer coming back for my 4th par in the last 5 holes. Another short hole meant another 4 iron from the tee. I didn't catch it very well, but the ball found the fairway and left me a good look up the hill at the pin. My 7 iron from there was about 18 inches from being perfect but instead, I watched as it hit the rough just shy of the green and rolled down into the bunker. I blasted out from there to about 15 feet and very nearly made that for par... but settled for a bogey instead. Looking back on my round, I'm pretty sure this is where I threw my chance out the window. I was on a roll having played the last 6 holes in +2, but on this tee... I hit the worst 7 iron I possibly could have. I watched as the ball hooked wildly to the woods on the left and then hit a house. I had hoped that I hit the house hard enough that the ball kicked back into play, but... it was out of bounds. My provisional was on line, but well short and in the bunker at the front of the green. A heavy blast from there left me 52 feet from the cup and I was unable to make that. The 2 foot tap-in gave me another triple bogey and took all the wind from my sails. Not knowing a course is almost always a big disadvantage. This came into play on this hole. I did not remember this hole from my round here last year, and... looking at the scorecard, I figured it was a reachable hole. I didn't realize that only a perfectly placed bomb from the tee would allow a shot at getting to the green with my second shot. If I had known that, knowing that I was struggling with the driver, I probably would have elected to hit a 4 iron from the tee... but, instead... I went at the ball with everything I had and a driver in my hand. This resulted in a pull-hook into a hazard. My drop, up the left side, meant that I had nothing but a punch out. That left me in the fairway but nearly 200 yards away. My hybrid from there was left in a good position, and I hoped that I'd have been able to get up & down from there, but a poor pitch put that to rest and I ultimately settled for a third triple bogey and the realization that, unless I did something really special down the stretch... my shot at finishing in the money was gone. I hit an ugly, fat 8 iron from the tee here as it was only playing about 140 yards or so. My pitch shot from short of the green hit the cup with some pace on it which prevented it from falling, but left me a fairly simple 4 footer for a par in the midst of all the chaos in my game. I finally managed to put a good swing on the ball with a driver here, unfortunately, my line was a little too aggressive and the ball ran through the fairway, preventing me from an opportunity to go for this green. Instead, I had to punch below some trees up the right side and back into the fairway. This left me a wedge, but I picked the wrong wedge and ended up 70 feet short of the hole. A three-putt from there, while expected, was painful and led to a bogey while wasting a good drive. A 4 iron from this tee found the fairway (I hit 4 fairways in 4 attempts with that club throughout the day) and left me a perfect 8 iron distance to the hole. I tugged it and watched as it kicked off the hill and to the left, right towards a pond. Luckily, it got caught up in the rough and left me a pitch up to the hole. As I had been doing all day, I hit another pin. It didn't drop, but it left me a 6 footer for par... which I promptly proceeded to miss. Another bogey after being in great position off the tee. Even though it's a short hole, it plays uphill the entire way. This led to me hitting the driver again, but I hit a good one here. Just as with the 6th hole, I took the wrong line and ended up through the fairway. Another 8 iron... but this one came up short. The way I was chipping the ball, I should have chipped this one... but, I went with the putter through the fairway. Luckily, the ball hit the pin, again, but it still left me 9 feet above the hole. I hit a horrible, ugly putt from there that ran 6 feet past the hole and I couldn't make that coming back. A three-putt double bogey that felt more like a four-putt because I putted from just off the green. After the last hole... I was stewing. My goal had become to finish second in my group because I knew that one of my playing competitors was going to win the tournament by this point. He'd been playing solid golf all the way through. This is a hole I could have gotten away with hitting a 4 iron from the tee, but I wanted to be aggressive and hit my driver. Once again, my line was too aggressive and it resulted in putting myself out of position from the tee. I was left with nothing but a 4 iron beneath some trees which ran into a bunker in front of the green. I blasted out to about 24 feet then hit a decent putt to about 3 feet. Then I completely fell apart standing over that ball and pushed it well right, leading to another double bogey. I figured, standing on this tee, that I would need an eagle to have any shot at being in the money. I ended up hitting one of my better drives of the day into the left side of the fairway. I was left with about 220 yards, down a hill and over a pond to the green. I knew if I struck a hybrid well, I'd carry the water and get to the green. Whether it was a lucky thing or not, I hit a horribly fat shot from there. The ball ran out into the fairway leaving me a sand wedge to the green. I put that to about 20 feet for a birdie attempt. I hit a putt that was right on line but came up about 4 feet short... then, for the 4th consecutive green, I missed a putt inside 6 feet and was left with a tap-in bogey to close out my round. Even though I felt like I threw away my chances on the holes where I put the ball out of bounds from the tee, the struggles I had on the greens were ultimately what did me in. The winner was the guy from my group who posted an 88. A 92 would have put me in a tie for 4th. It reiterated to me that, playing in the C Flight, I'm never really out of it and I need to focus on every shot because it has the potential to be THE shot that puts me into or takes me out of the money. Next weekend is the final tournament of the year for the Charlotte tour. It's a 2 day major played at Country Club of Salisbury and Irish Creek, which are 2 of my favorite courses. After that, there is a 3+ week break until the National Championship in Hilton Head. That means that the tournament next weekend is my final opportunity at a major and my final opportunity to win my way into the National Championship. I know I've got some work to do between now and then!